The artist Bjoern Schulke has created a work that also listens and watches and surveillance issues are one major theme that Schulke explores in many of his works. 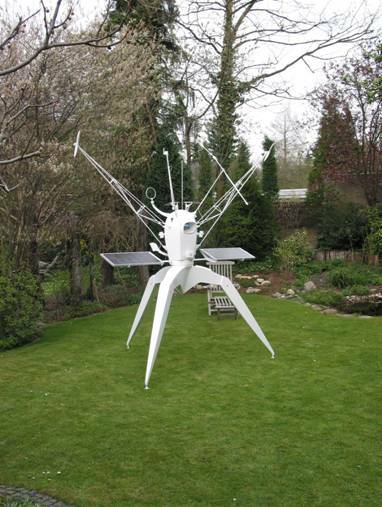 Planet Space Rover by Bjoern Schulke, 2004. Height 290 cm, working diameter 300cm. The artist/inventor Julien Maire has been creating emotionally moving cinematography for many years. He uses small DC motors in a unique way that allows him to bring motion into moving visual and sound montages. 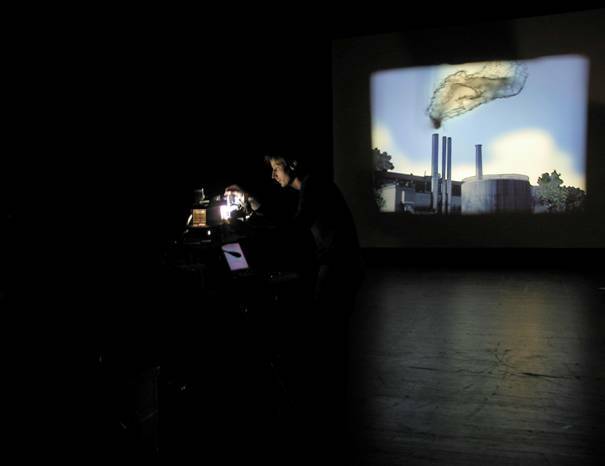 His work Demi Pas (yr) is about a day in the life of the artist, and features a series of inventive slides that are inserted into a custom made projector along with a rich sound track that helps to develop the narrative of the work. .
Demi Pas by Julien Maire. 1995-1998. 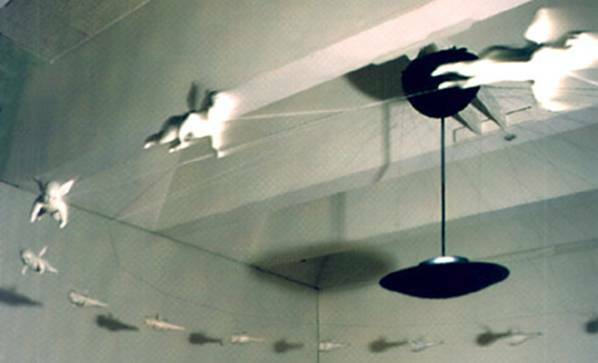 The slide to the left allows the hand to move back and forth and the shadow of the artist is superimposed into the scene. A PIC Basic chip-programming platform was used to control the motors. 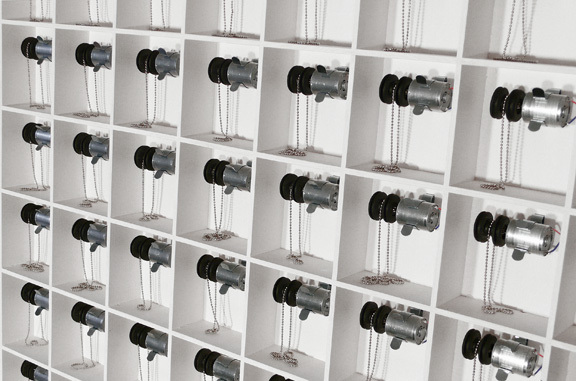 Gregory Barsamian is an artist who explores persistence of vision by using motors and specifically timed strobe lights to visually morph spinning objects from one shape to another. Putti ( Helicopter Morphs into Angel) by Gregory Barsamian. 1991. 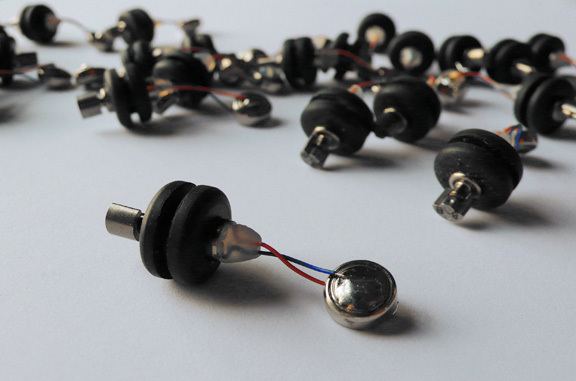 The sound installation artist Shawn Decker uses motors and steel to fashion new sound environments. These pieces explore rhythmic patterns that are derived and inspired from natural processes. Scratch Studies by Shawn Decker. 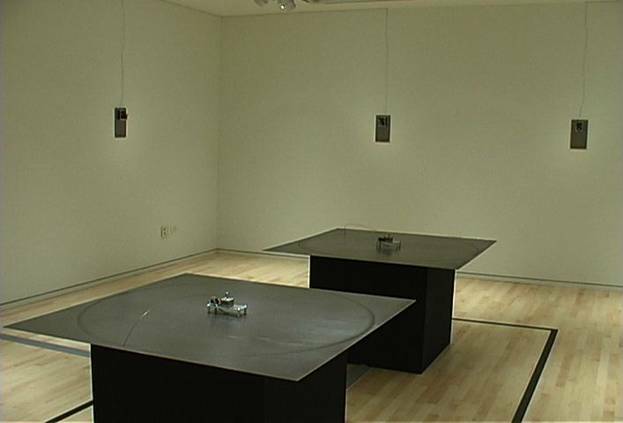 2000.Block Museum, Northwestern University. Decker’s computer algorithms investigate various natural patterns ranging from highly ordered to sporadic and disorganized. The patterns are based on processes as diverse as Brownian motion (the movement of particles in fluids), bird song rhythms and migratory patterns, and statistical studies of large populations. The artists team PE Lang Zimoen have used many motors all running simulataneously to create complex and alluring sound and motion installations.